Happy Monday, and welcome back to Drink Read Love. It's been a hot minute since I blogged, but that is neither here nor there, because I am now here, and so are you, and I'm *so excited* for the books we're going to talk about this week! I will start this off by saying that the author of these books is my dad, and I received these books for free as a gift (with no expectation of review, just a plain straightforward gift) from my parents. However, the opinions in this blog post are my own and are not influenced by the author being my dad. I would not ever recommend something unless I genuinely liked it on it's own merits, regardless of my relationship with the creator. First, the overviews. I would be remiss if I didn't tell you that there may be some spoilers below, although I'll try to keep it to a minimum. Volume I: Year of the Dragon Lord. From Amazon: "Several times throughout history, dragons have dwindled in numbers and retreated from interacting with humanity. Within a few generations we relegate stories of the mighty beasts to myth and cease thinking about them. But dragons eventually return with a vengeance. And vengeance is a defining thought for Gerald, a teenage orphan in Scotland in 1511 A.D. as he heads off to Cair Parn, the local castle, to finish transitioning to adulthood. Much of his time there involves learning to fight both men and dragons. Gerald relishes the latter, believing he lost loved ones to draconic pride and arrogance. On his quest to become the greatest dragon lord of all time by killing every dragon on the planet, Gerald has to grapple with the possibility that dragons-- like humans-- are not all evil. But he knows for a fact that some are, and one in particular needs to die. When they finally meet, Gerald has to face some facts. Argyll is huge, vicious, at least as smart as Gerald, and possibly deranged. And that's the simple part of Gerald's life." Volume II: Nemeses Unexpected. From Amazon: "After being present at the dragons' moot where most of them declared peace with humans, Gerald hopes his life will slow and calm down. His first hints that this will not be the case are bizarre dreams involving an utterly dead and destroyed Edinburgh. In these dreams he encounters a mysterious talking skull and a wizard version of his nemesis- the fierce dragon named Argyll. The next few months find Gerald dealing little with Argyll, but a great deal with the kings and queens of Scotland, kidnappers, an inquisitor, the dragon who stole his adopted mother, and rebellions. Responsibilities far beyond any he expected as an adult- never mind at fifteen- consume the next few months of Gerald’s life. And it's not always obvious who is friend and who is foe. Sometimes people can be even more difficult than dragons. " Volume III: Into Otherness. From Amazon: "Sometimes the edge of madness is the only sane place. Gerald and company race back to his hometown to face his nemesis Argyll, but the dragon has vanished without a trace. In Argyll's wake Gerald finds only mystery and misery. A great dragon lord is missing after a nearby battle that no one in the village noticed, despite a large chunk of forest being laid waste. The biggest clue is a stump that is no longer wood, containing a cursed sword no one has been able to remove. Evidence suggests the involvement of someone who died centuries ago. Despair, strange visions, lethargy, jealousy, and other vexations plague the inhabitants of the formerly peaceful Scottish village, including Gerald and his fiancée Sally. Gerald must find the source of these curses and break their evil magic by traveling to a country he has never heard of, somewhere to the east. Once there, he ends up spending the night inside an active volcano. After that, things start to get really weird." These books are great. I don't always enjoy dragon books, but I love these. It takes a rare talent to be able to make YA books interesting to adults without being so heavy that they lose appeal to younger readers, but that is exactly what Miles O'Neal has accomplished with the Dragon Lord Chronicles. The characters are engaging from the very first page of Volume I, and they only become more so through the rest of the series. The dialogue is natural rather than stilted, and the descriptions are vivid, making locations, scenes, events, people, and dragons come to life. When I read Into Otherness, I was so transported away into the story that at one point, I lowered my book, looked outside at the mountains in which our house is located, and half expected to see dragons flying about. Sometimes, it's hard to remember that these characters and events have come from someone's imagination and aren't actually going to be in history lessons my kids sit through at school. I had the chance to read an early draft of the first book while I was recovering from giving birth to my third baby. Alas, my hormones were a little... precarious... and I found myself unable to finish the manuscript due to maternal sympathy for a pig. Side eye to my hormones. But, after the book was published, when I did get a chance to read it, I was immediately impatient for the next book. Naturally, I re-read the first book before reading the second book. 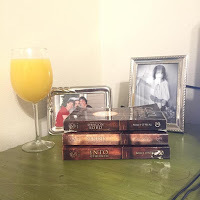 Then, after reading the third book (for which my impatience was three times that of waiting for the second book, even though I got to read an early draft of the third book), I promptly went back and re-read Books 1 and 2 again. My point being, even though I remembered the events, I love the books enough that I have read them multiple times over the space of just a couple of years. As for the question of what drink pairs well with this series, I feel like this requires separate answers for each book. For Year of the Dragon Lord, I think hot chocolate goes nicely, as I can imagine the characters holding steaming mugs of the delicious liquid in their hands as they recover from certain chilly journeys. 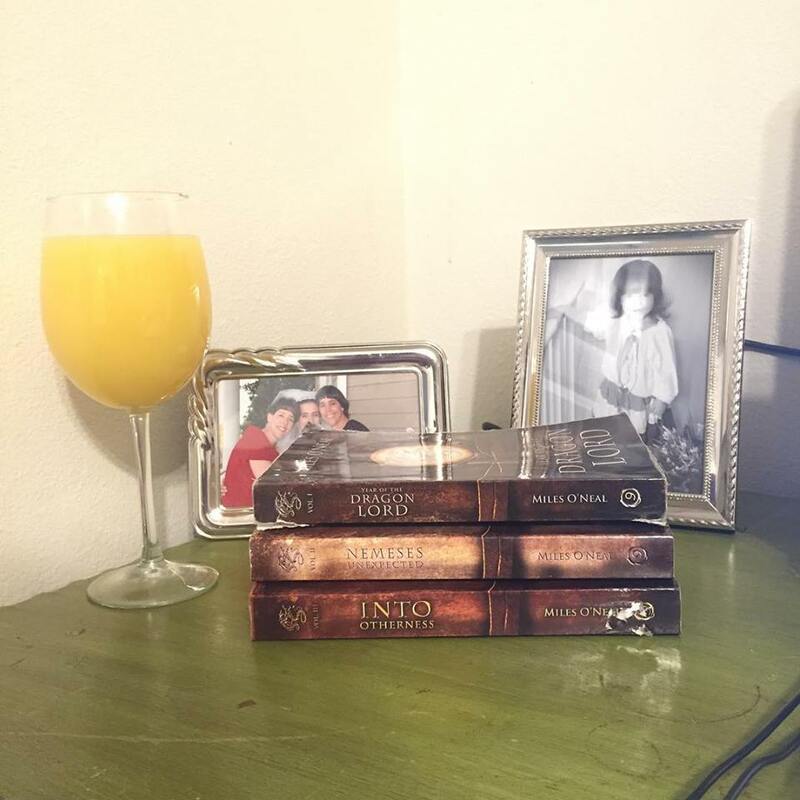 For Nemeses Unexpected, I'd have to say a nice mimosa, because I was drinking precisely that (orange juice plus Cupcake Vineyards Prosecco, specifically) while I read Nemeses the most recent time, and somehow, it just matched. With Into Otherness, I'd pair my favorite German beer, the amazing Monchshof Radler. Mostly because Miles O'Neal went on a trip to Albania to do some on-site research for Otherness during a trip visiting my family while we were still stationed in Germany, and I really miss that specific tasty beverage. Thanks for tuning in, and come back the rest of the week for Top 10 Tuesday, an Author Q&A, and a very *very* special edition of The Cat's Meow.